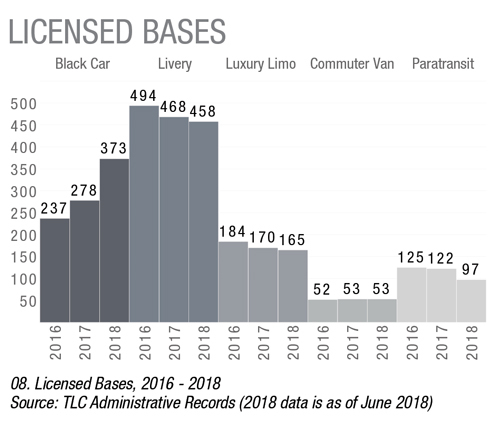 The New York City Taxi and Limousine Commission (TLC) announced publication of its 2018 Facebook on September 26, 2018 giving insight into an industry that has undergone significant change in recent years. The TLC collects and publicly shares a wealth of data about taxis and for-hire vehicles in New York City, on a scale that is unprecedented anywhere else in the world. This data, as well as the TLC's close engagement with stakeholders, helps the agency create smart policy that ensures professional, safe and accessible service. The Facebook provides a range of facts, from trip trends to lost property, the number of wheelchair accessible vehicles, and the number of electronically requested taxi trips. 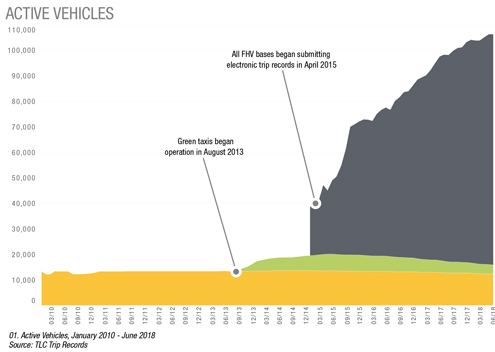 For the first time, it also includes facts about shared rides after this data in the for-hire vehicle sector became available last year. 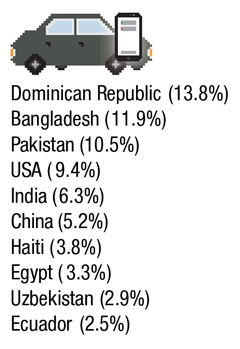 The data also illustrates the international diversity of professional drivers in New York City. "Change has always been a constant in the taxi and FHV industries, but the pace of change has been unprecedented over the past several years," said Commissioner Joshi. "This Factbook provides a multitude of ways to quantify these shifts. It is a practical and valuable tool for drivers, owners, businesses, consumers, and transportation think tanks and we are proud to bring this level of transparency to the public"
Since the prior Factbook was published in 2016, there have been important changes to the industries the TLC regulates. The Accessible Dispatch program, allowing passengers to remotely "hail" a wheelchair accessible taxicab on demand, has expanded across all five boroughs. Whether you are in the Rockaways, Coney Island, Soundview, or Mariners Harbor, the program lets riders book an accessible trip via smartphone app, website, or by phone call. Almost 7,000 trips were provided by the Accessible Dispatch program in June 2018, and it continues to grow in popularity daily. 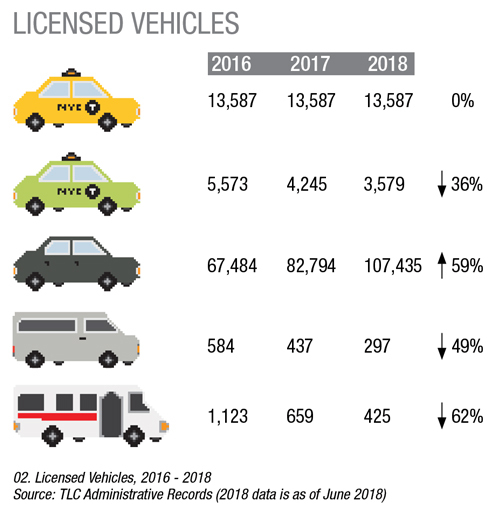 There are also a growing number of Access-a-Ride trips taken in TLC-licensed vehicles, thanks to the TLC's participation in an MTA pilot program. Shared trips in New York City have also been on the rise. Between June 2017 and June 2018, more than 41 million shared trips took place. Some of the most popular neighborhoods for shared pickups include Crown Heights, the East Village, East New York, and Canarsie. The TLC continues to use available data to honor the city's safest drivers with its annual Vision Zero Honor Roll. The event recognizes between 300 and 400 professional drivers each year since the Safety Honor Roll began in 2014. The stringent criteria for inclusion in the Honor Roll require that drivers have no crashes involving a fatality or injury, no traffic violations, and no violations of TLC safety related rules for the past four or more years. The TLC supports drivers in their important work to keep streets safe with driver education and outreach. The Upper West Side is the most popular neighborhood to electronically request a taxicab. High volume for-hire service companies had the highest number of pick-ups in the East Village, followed by Midtown and Union Square. Saturday at 11 p.m. was the most popular time to share a ride. 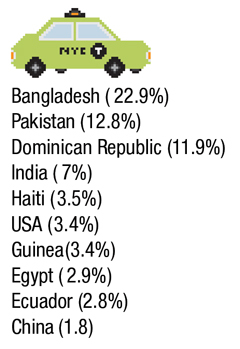 Over half of all drivers hail from Bangladesh, the Dominican Republic, Pakistan, the United States, and India. 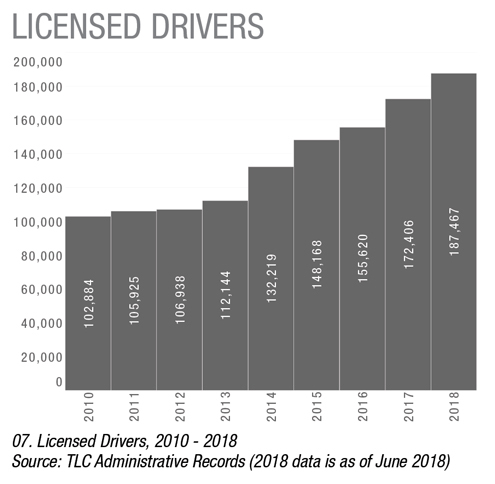 More than 85% of TLC-licensed drivers live in New York City. Since 2016, the Taxi Improvement Fund, which supports the adoption of wheelchair accessible taxicabs has paid out almost $37 million to vehicle owners, and $7.5 million to drivers. It is funded by a 30-cent surcharge on yellow and green taxi trips. The TLC was created in 1971, and is the agency responsible for the regulation and licensing of over 300,000 yellow medallion taxicabs and for-hire vehicles, the men and women who drive them, and the businesses that operate and support them. The TLC is recognized as the largest and most active taxi and for-hire vehicle regulatory body in the United States. To find out more about the TLC, or to review its rules, regulations and procedures, we encourage you to visit our official web site at WWW.NYC.GOV/TAXI or call 311 in New York City, or 212-NEW-YORK from outside of New York City. The terms licensed and active are used to define vehicles and drivers in the Factbook. Licensed refers to vehicles and/or drivers currently in good standing with TLC's licensing division. Active refers to drivers and/or vehicles that provided at least one trip in a given time period. There are more than 125,000 licensed vehicles and 185,000 licensed drivers. The growth has not been distributed evenly, however. 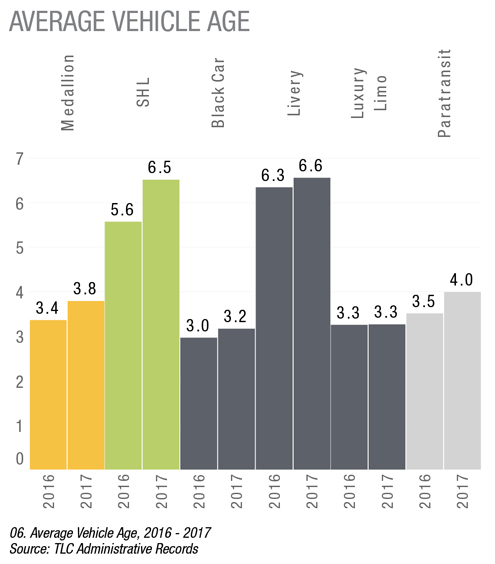 Over the same period, the number of medallion vehicles has remained steady while boro taxis have decreased. 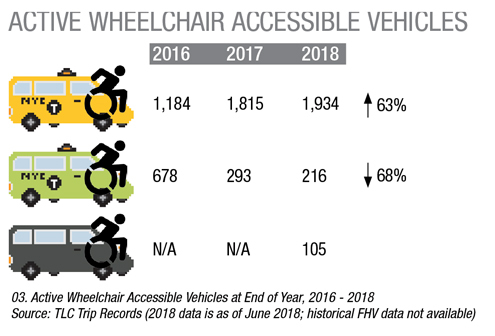 Wheelchair accessible and hybrid vehicles are also more prevalent. 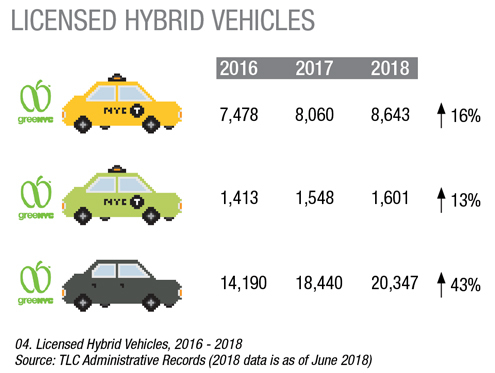 The number of total WAVs on the road has increased 15 percent since 2016, and there are more than 30,000 hybrid TLC vehicles. TLC-licensed drivers represent the diversity of New York City. Professional drivers are born in dozens of countries and speak over 100 different languages. 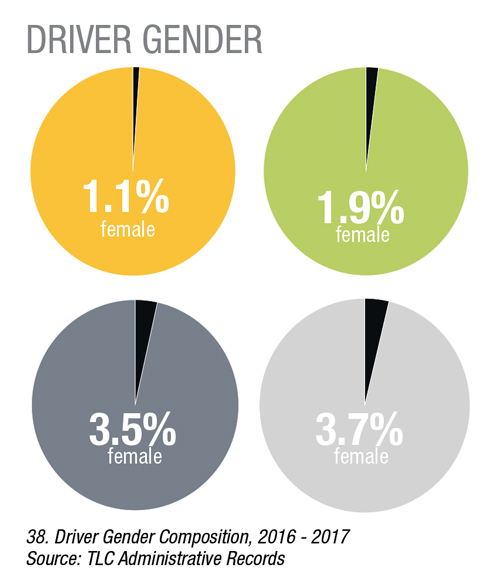 The average driver across the industry is male and below 50 years of age. 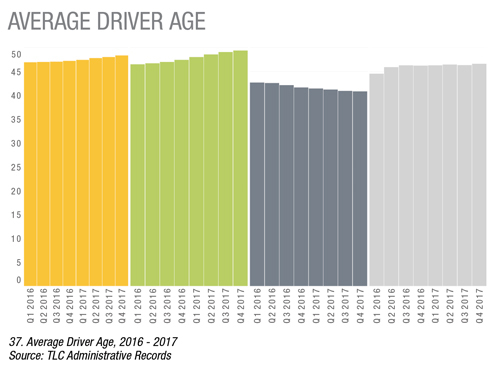 FHV, and especially High Volume base drivers, tend to be younger than SHL and medallion drivers, and their average age is decreasing over time. 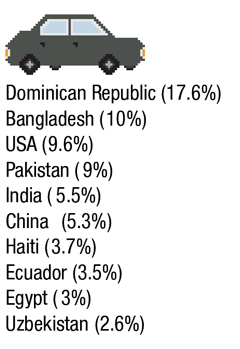 Over half of all drivers hail from five countries: Bangladesh, the Dominican Republic, Pakistan, the United States, and India. 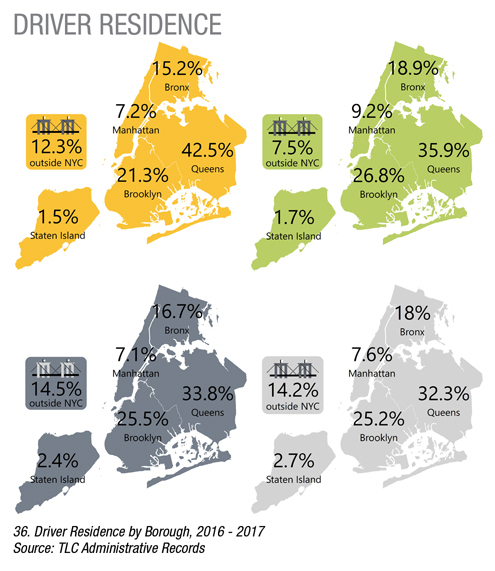 Over 85 percent of drivers live within the five boroughs, predominantly in Queens and Brooklyn. Russian and Simplified Chinese were added in November 2016; Arabic will be available in the fall of 2018. 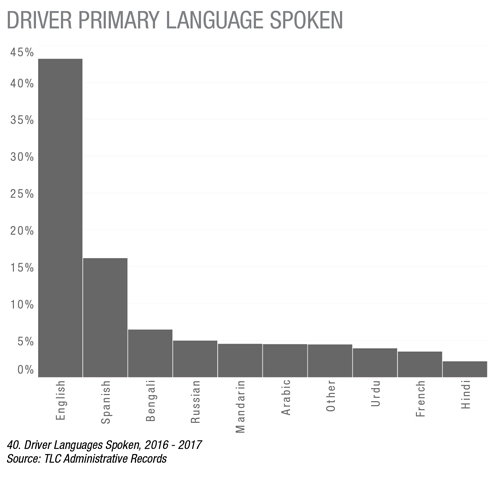 Two-thirds of drivers choose to take the exam in English; Spanish is the next most common test language, followed by Russian, Chinese, Bengali, and Urdu. 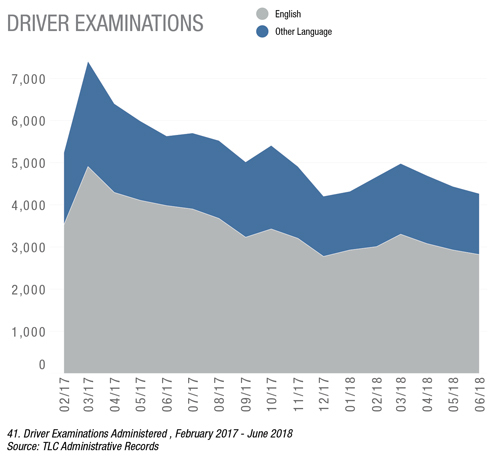 Since February 2017, more than 90,000 drivers have taken the exam.